I would love some of these. FANTASTIC! Go for It Irish...lol, while I'm still sitting down...! Going to start calling you Thumbelina - you look about 2 feet tall in this photo.Great shot. Wow, this is amazingly big! i'd like to see the elephant with ears this size! If fish grow in relation to their pond area I wonder if Japanese beetles grow in relation to their food leaf size. Keep us posted FC, its been nice knowing you. wow ! One would certainly require lots of space to grow these plants. FOMCL....Ams, Now you've gone and scared the crap right out of me....! There may not be a tropical bed next year, or maybe I'll make a miniature, tabletop size tropical bed. NO,no,no...What the he**, I'm going for it..., this might be the last time you hear from me, so... it's been nice knowing you...sob. Wow .... just AMAZING!!! make a great umbrella for the next monsoon!!! Is this a colocasia, Flcrazy? Lori this one is a colocasia, the one to the left side of the screen is an upright Alocasia, it's size surprised me too. The leaves on the alocasia are more stiff and shiny than the colocasia. Thanks for the confidence boost Ams, I'll try not to let you down...lol. P.S. Lyd, I'm expecting you to come up with a special, super-duper elephant ear rake for my aching back. I'm counting on you ! I'll just count myself lucky if they don't 'X' it out, all together ...lol ! Hubby is an ace camera-man. Was he wearing his boots when he took the picture? The GoY Wellie Olympics team would benefit if you would please consider taking on the extra role of Official Pin-Up Girl. You'd be great at any GoY Wellie Olympic event involving lifting above the head. It's clear that's your favourite sport. Lol...., very clever play on words, Lyd ! I'm quite impressed..! No TT, notice I'm smiling, so no wellies on at the time. He only pulls them out when he wants to put me in my place...lol. It's the only ace in the hole he has !Can't wait to tell him I'm being considered for the pin-up. He will find that hilarious ! After dealing with me for the last 30 years, he might know best...You could find a much better pinup, afraid we'd be the laughing stock of the wellie olympics. Unless all pin-ups at the olympics are going to be the clowns... if so, I'm your girl ! Flcrazy, this is an incredible picture. Do the Alocasia and Colocasia freeze to the ground in the winter? I know they are tender to cold. 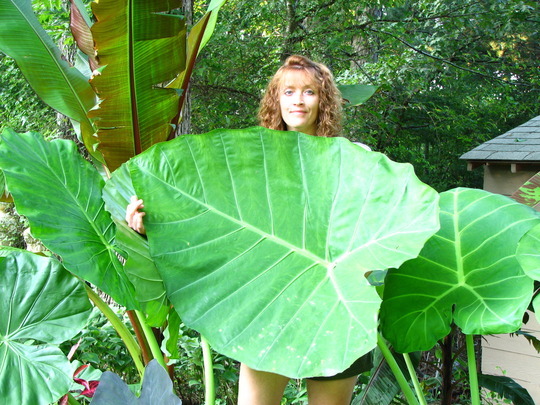 I have been growing Alocasia, Colocasia, and Xanthosoma for about 25 years. I live in San Diego, CA. and have seen Alocasia macrorrhiza "Borneo Giant" and Alocasia calidora with leaves approaching 8 feet long and 4 feet wide. Xanthosoma sagittifolium leaves get even larger. The trunks on Alocasias can grown to eventually 12 feet tall in a frost-free locations. Yes Delonix, they all die back to the ground by the first of November when we have our first freeze. Some of the colocasias are hardy to zone 7, but if left in the ground ,most don't start to emerge until late May, or early June. The Alocasias are not hardy at all, and have to be dug up and brought in for winter storage. I can only dream about the size they could get if I were able to leave them outside year round...., you're so lucky ! I love this picture... Thumbelina does suit :) Great shot! Are there dinosaurs at the bottom of your garden? The plants certainly seem to be roaring away. That is amazing! I knew they got big but not THAT big! I believe they wore "fig" leaf undies! Lol...., you got that right, Terratoonie ! Probably why you call autumn the fall - oops. Hahahaaaa.... You're too good ! They get washed everyday Rob, evveeeryday....... Are you starting to feel alittle sorry for me yet ?! Well no not sorry just a wee bit guilty.